Cleaning tough surfaces isn’t everyone’s idea of a good time, but having a powerful high-tech piece of equipment at your disposal can make the job a lot more rewarding. For many outdoor cleaning jobs, and certain tricky surfaces such as window panes and car bodywork, anything other than the right piece of kit simply will not do. We’ve outlined five essential high-tech cleaning gadgets and accessories that will make your cleaning task easier, and help to lengthen your leisure time in the process. 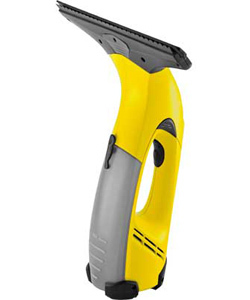 This clever little piece of cleaning equipment comes from top manufacturers, Karcher. It’s a hand-held battery operated device, which means you can take it anywhere. The best thing for us is that with a Karcher Window Vac there are no streaks. A sucking device picks up all drips and makes sure your window panes are left absolutely streak-free. It’s adaptability makes it perfect for other surfaces too: car bodywork, shower tiles and glass tables can all benefit from a clean with a Karcher Window Vac. Lightweight and efficient, this is one handy little vac that comes highly recommended. If you’re cleaning down outdoor surfaces such as patios, garden walls, pathways, even car bodywork, the one and only piece of cleaning equipment you must have is a pressure washer. Available in a range of sizes from heavyweight petrol machines (of which more later) to easy to use models suited for more domestic tasks, there is a huge range of models available. If you need something to help you clean up smaller areas around the garden and garage, we would recommend a Nilfisk C100 5-5 Pressure Washer. These compact machines are small in stature but pack an impressive punch when it comes to getting things clean. 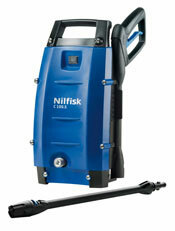 Portable, robust, and with a range of nozzle options, a C100 5-5 from Nilfisk gets the job done – with no extra fuss. If you’re power washing your patio, or other slightly larger smooth surface areas like decking and driveways, this handy Nilfisk Patio Cleaner Plus accessory could be exactly what you need. Its rotating jet nozzles help to clean away moss and lichen. 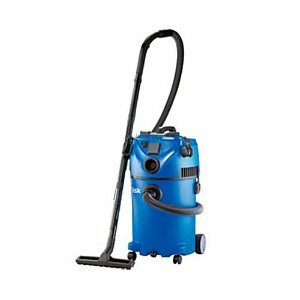 Made by Nilfisk, it attaches easily to other Nilfisk machines, and makes the perfect addition to your power cleaning arsenal. This is where things get a little more serious. A petrol pressure washer, such as Karcher’s G4.10 takes things up a gear cleaning-wise. 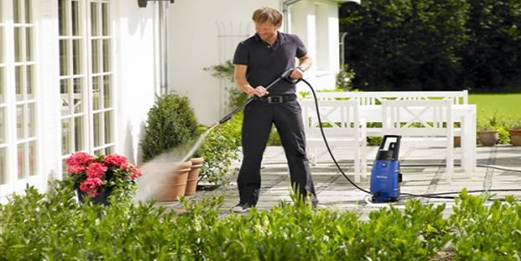 Because it isn’t dependent on electricity, a Karcher G4.10 enables you to clean areas further away from the house. 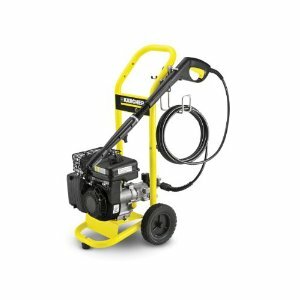 Consistent, durable and clean-running, with a 250cc 4-stroke engine, these pressure washers deliver an efficient cleaning performance every time. Blasting gallons of highly-pressurized water all over your patio / decking / driveway / garden walls / car is going to leave a few puddles around the place. A wet and dry vacuum cleaner is exactly what you need to help clear up. These high-tech cleaning gadgets come with range of capabilities and really are invaluable pieces of equipment for indoors as well as outside the home. Even a small machine, such as Nilfisk’s Buddy 15 Vacuum Cleaner, is capable of tackling jobs an ordinary vac would have no chance with, and is able to pick up sludge, ash, wood chip, sand and soil. 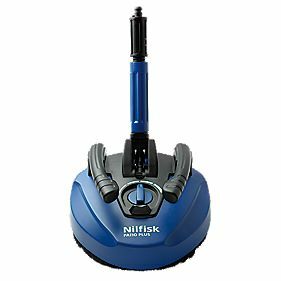 The Nilfisk Multi 30 T Vacuum Cleaner is a bigger device which can be connected to other power tools and has a blow function as well as a semi-automatic filter cleaning system. There are high-tech machines for every kind of tough cleaning job you can imagine. 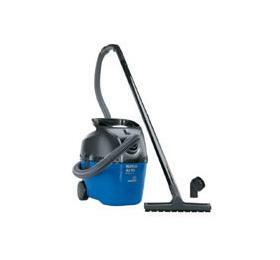 For more details on the cleaning equipment mentioned here, and more great cleaning devices, visit PressureWasher.co.uk. Categories: Home & Garden, Shopping.